See our order form link, below. All books mentioned, 10% off. Perhaps you have been taken in by the stories of law, politics and political campaigns in shows like The Good Wife or one of the best shows ever on TV, The West Wing, or even the comedy hit Veep. For a bunch of reasons, Beth and I have been really enjoying Madame Secretary. (How cool is it that the show features a major character who is, among other things, a religion professor and Aquinas scholar at the Army War College?) But despite these shows dramatizing the moral ambiguities of many social issues and underscoring the hardball maneuvering of campaigns – yeah, I’m thinking of you, Eli Gold — nothing in fiction has prepared us for the stunning weirdness of this current election cycle. I’ve tried to avoid thinking about why so many of our fellow citizens (and, apparently, fellow Christians) are attracted to Donald Trump, and I’ve not shared the many thoughtful on-line opinion pieces about our current situation. Kudos those who are doing reasonable work on this, but I have hardly been able to bear it. 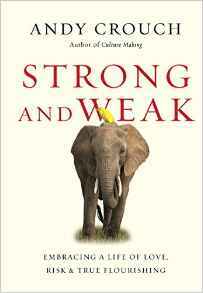 Rather, I have taken an intentional step back, reviewing books that, if read and discussed among us, could have significant, long-term, civic implications, books like Andy Crouch’s wonderfully insightful Strong and Weak: Embracing a Life of Love, Risk, & True Flourishing (IVP; $20.00) and James K.A. Smith’s significant new work about how habit, liturgy and realigned desires can be shaped by Christian worship, for the sake of the world. 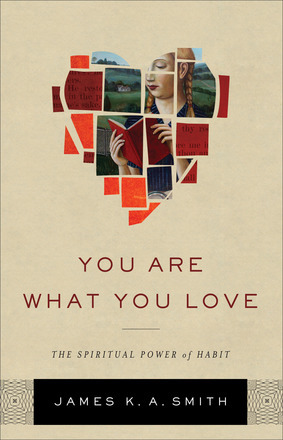 If you haven’t, I hope you studied my two recent, long reviews of Smith’s You Are What You Love: The Spiritual Power of Habit (Brazos Press; $19.99) first here and then here. The first, especially, is somewhat of a backstory, written in anticipation of the release of YAWYL; the second also included a bit more of my take on how Smith came this recent project and why I care so much about it, and then dove into a fuller review, chapter by chapter. We’ve really appreciated that some have shared this review among their own friends and tried to generate some sales for us. It is our joy to tell people about these kinds of books and hope that one of the things people desire, one of the habits that shape their wants (to use Smith’s phrases) is spending money at places they believe in. Anyway, it’s good to recall that political life is part of a bigger cultural story, informed by the zeitgeist, and that our views and behaviors as citizens, as Crouch implies, and as Smith specifically shows, emerge from our deepest character, our virtues and habits and longings and the story we see ourselves to be a part of. If we hope to re-calibrate our attitudes and practices in our civic life we must deepen our discipleship by allowing our hearts to be changed. And that, my friends, happens best in church. In YAWYL, church and worship are not alternatives to civic life, or a super-spiritual move of “world flight” Christianity disengaged from public concerns, but is a worldviewish radicalizing of us and our desires, in church and home, for the life of the world. As we become more Christ-like and long for His Kingdom ways, then all of life will begin to be seen as inherently religious, with the possibility of Godly transformation, starting with our own convictions and lifestyles. Including our understanding and involvement in politics as citizens. I don’t mean to be melodramatic, but it may be, therefore, that Smith’s You Are What You Love and Crouch’s Strong and Weak may be among the most important books to inform your politics that you’ll read this year. Of course, if our deep desires are for imagining God’s Kingdom, and living coherent lives shaped by Biblically-informed visions and virtues, if our hearts are truly longing for God’s glory to be seen more in our broken world, then we will necessarily want to develop some kind of uniquely Christian view of the common good, of public justice, and of the role of politics. You will desire a “Christian mind” about what the best Christian traditions and writers have said about government, politics, the task of the state and the nature of responsible citizenship. 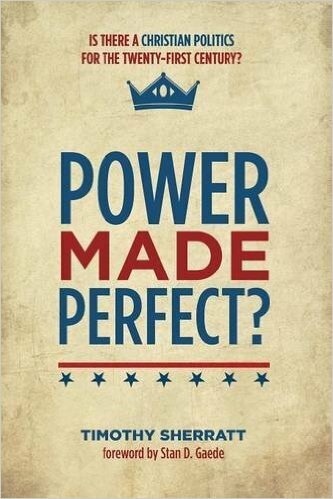 I have written a number of BookNotes columns for our bookstore blog over the years inviting us to think more faithfully and live more graciously in the public square, and I have named my favorite books on faith and politics. Read two of my columns with lists HERE and HERE. There have been newer works on faith and politics released, but those lists are still useful and we’d be glad if you shared them. Here we have the resource many citizens have longed for…Christians who are tempted to give up on political engagement will be refreshed by the wise and practical counsel contained within. I myself am looking forward to reading this, as I very much respect the author, a Professor of Political Science at Gordon College. But there is another new one I must tell you about, and I am jazzed about it for several reasons, not least of which is that one of the shining parts of this multi-authored, back and forth volume, is the contribution by James K.A. Smith. Sometimes (well, quite often, actually) I wonder how some of these authors do it. As Smith was writing the profound and beautiful YAWYL he was also writing a long and great chapter on Reformed views of Christian politics, and responding astutely to four other co-authors from other Christian traditions, replying to their own claim of what Christian politics looks like for a brand new volume. At the risk of sounding like a political geek or a Jamie Smith groupie, I want to tell everyone about this multi-authored book about politics for reasons I will state below, but also because of Smith’s very good role in the book. I am partial to Professor Smith’s writing, his ecumenical flavor, his knowledge of the Dutch tradition of public theology (such as Bavinck and Kuyper and Dooyeweerd) and his great gift of being able to write about complex matters with incision and clarity and what seems like joy. If you are a James K.A. Smith fan, you will want to read him in here. As I read each essay in this new book, each one representing a different take on the relationship of church and politics, faith and government, and each of the five author’s rebuttals of each other — it is one of those “counterpoints” books — I found myself appreciating Smith’s pieces each time. He is a remarkably well-read scholar and he is spot on in bringing just the right insight at just the right time. I would guess that had this been a live debate, most of the other conversation partners might have been nervous being in counterpoint with him; in this, though, they all are exceptionally cordial and more than civil. This book was a model of pleasant, if at times pointed, discussion and a great learning experience. Each author obviously knows their theological tradition quite well. The five views represented in this volume were pulled together and helpfully introduced by Dr. Amy Black, herself a serious political scientist (with degrees from Claremont and MIT) who now teaches at Wheaton College and is widely published. Kudos to Ms Black, not only for creating such a helpful volume, but for her own writing in it — not only is the introduction very well done, but the closing chapter (“Christian Witness in the Public Square”) is practical and useful as she tries to draw on the best practices of these varying traditions and suggesting which strengths of each might be fruitful for our own growth and fidelity in the political sphere and public life. Roman Catholic (Synthetic) by J. Brian Benestad of Assumption College in Worcester, MA. A feature of this book that should make it widely appealing for thoughtful church classes or book groups or even in colleges and seminaries is how it is shows how the views of the church and the basic ethos of each theological tradition shapes how they then tend to approach public life. In many ways Five Views on The Church and Politics is as much about church and theology, adding to a needed ecumenical conversation between and among us church folk as it is on Christians as citizens or those active in political life. The authors are not political scientists, it should be noted, which, I suppose, is both a strength — making the book more widely interesting for any who care about the wider church, but may therefore be a little weak in terms of its goal of nurturing the Christian mind in politics as such. In fact, this approach, and even the book’s title – am I over-thinking this? – points to this assumption; it is not just about varying views of statecraft or policy, but about how each faith tradition sees church life, and how church life relates to daily life and society. Yes, each chapter does get around to thinking Christianly about politics as such, eventually, but the chapters are by design as much about theology as they are political science, and as much about church history as political history. Five Views on The Church and Politics will thrill church history fans and will be a boon to any of us who long for greater ecumenical awareness and inter-denominational dialogue. I think that all but the most focused politicos will find its broad themes — how various church traditions have related to the world, to culture, to public life — a great place to start (rather than digging too deeply into nuances of political theory as such which it mostly does not do.) For some of us we might wish for a bit more specificity about politics and the messiness of voting well, party involvement, policy proposals and such, but for most of us this big-picture view will bring us up to speed quite nicely. Bring us up to speed? Exactly. 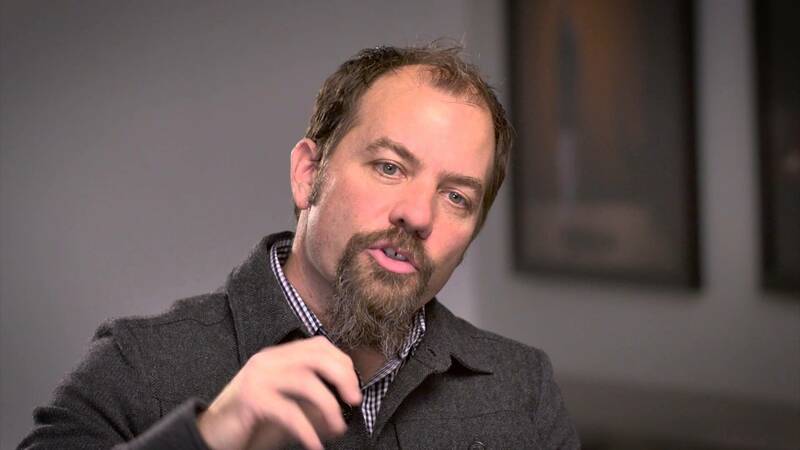 You see, I suspect that most of us — even the sharp and well-read fans of BookNotes — are woefully unaware of the ways in which great Christian thinkers that have come before us have written and taught about Christian political life. This is why I have offered lists like the ones mentioned above, or done extensive reviews of the very, very important historical overview of Christian thinking about the state, The Good of Politics: A Biblical, Historical, and Contemporary Introduction written by James W. Skillen (Baker Academic; $24.00.) Do check out my review of that, here. Skillen helps us see — through his own particular lens and opinions, of course — the strengths and weaknesses of many great public thinkers who wrote about politics and justice down throughout history. Who knew? Not every theological tradition has a robust and distinctive set of teachings we might call a “political theology,” but four in particular (Catholic, Reformed, Lutheran, and Anabaptist) stand out for their enduring influence on conversations about church and state over many centuries. A fifth tradition, that of the Black Church, is specifically rooted in the United States and represents a distinctive theological perspective, not to mention forms of communal practice, that is too often discussed in isolation or simply ignored. What a good spectrum of views, and what a good way to learn about some of the strengths and weaknesses of these five enduring faith traditions. As I said, it seems this book works well as a primer on inter-denominational/ecumenical discourse and the ups and downs of church history and differing theological impulses as much as a guide to thinking about modern citizenship. I commend such inter-denominational conversations to you. I hope I’m wrong, but I doubt such conversations are going on in your town, let alone in your own congregation, so you need to read books like this once and again to remind you and yours of other members of the Body of Christ and how they think and speak out as they do, and why. Especially in this season when Christians are courted as a voting block and evangelicals are routinely cited in the news for supporting candidates who are pretty obviously not very Christian in tone or substance. What the heck is going on? Well, part of what is going on is that good Christian people haven’t read books like this. In each chapter, the representative author first traces the historical developments of their own tradition, explaining some of the “foundational principles and theological distinctives.” Eventually, they get to their tradition’s view of government and its role in society. Some are, Dr. Black observes, “primarily optimistic, emphasizing the ways in which government promotes human flourishing and contributes to the common good” or they tend to be “pessimistic, focusing on the need for government to restrain the effects of sin.” Or, perhaps some are a mix of the two. 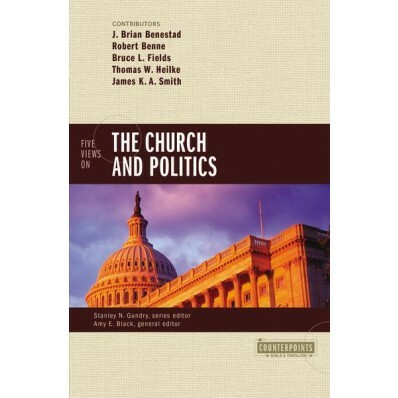 In a helpful move, each chapter in Five Views on The Church and Politics ends with a case study, asking how that faith tradition might address the situation of domestic poverty. How might their perspective address policy questions (if they do at all) about this? And, of course, then there are the rebuttals – often mostly affirming what the diverse authors appreciate about each other and what they share in common. I am not sure I am remembering correctly, but it seems to me that Professor Smith is the most pointed – gracious, always – but clear about differences. Perhaps it is because, in many ways, Smith’s Reformed view may, in fact, stand apart in singular ways in insisting that the doctrine of creation yields a positive view of culture and subsequent institutions (such as government) and that therefore, God’s redemption can be seen breaking into all areas of life, including politics. When his Kuyperian faith says “no dualism” it seems he really means it! Behind this assessment of government and politics is a problematic theology of creation that seems to write off swaths of creation as not only fallen, but almost diabolical. There is a kind of all-or-nothing take on government and politics here that is problematic. I cite this not to underscore any particular animosity Smith may have against Mennonite brothers or sisters (close readers know my own personal appreciation for some Anabaptist thought and practice) but to clarify how clarifying this book at its best really is. Particularly in the rebuttal sections, where each author says what they don’t agree with, brings to the fore some of the theological quandaries we must ponder. It is a good theological and spiritual exercise and very, very informative. To be honest, there are times in this book when the debate might have been a bit more feisty. 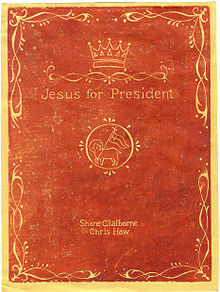 I sort of wish the Anabaptist voice had a bit of the passion and prophetic edge of, say, Shane Claiborne’s Jesus for President: Politics for Ordinary Radicals (Zondervan; $16.99) and that the Roman Catholic scholar, alongside his good explanation of natural law, might have talked more energetically about the consistent life views of the US Bishops. Indeed, it was Smith who noticed that Professor Benestad didn’t talk at all about the historic reading of Pope Leo XIII’s famous Rerum Novarum that has lead Roman Catholics to be generally supportive of labor and labor unions. Smith observes, politely, that Benestad offers a “selective” reading of Catholic Social Teaching. And while Dr. Bruce Fields, the black theologian and professor, cited many great sources (such as Cheryl J. Sanders, Renita Weems, Cain Hope Felder, the essential J. Deotis Roberts, and Peter Paris) it would have been interesting to have this dialogue with somebody like a James Cone or Cornel West or someone more overtly connected to the historic civil rights movement. To put a better spin on my small frustration I can assure you that the book is exceedingly fair, civil, no-nonsense, studious and is hardly contentious at all. 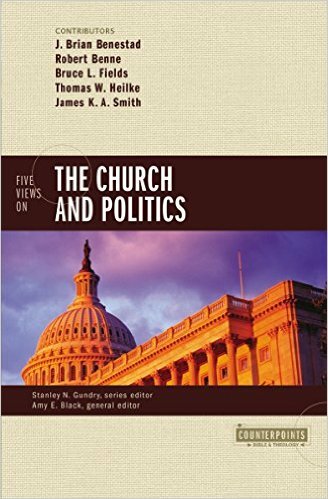 Five Views on The Church and Politics is a fine introduction to key theological traditions, to trans-denominational conversations, and to various models and approaches to the big question of faith and culture, social change, politics and the common good. But, again, I think it is best seen as a guide to understanding and appreciating differences among the church, and becoming more alert and wise and in some ways appreciative of each other. We don’t have to – the authors of this book would probably say we don’t get to – make up our own rules or ideas about all this. We stand within a great (diverse) tradition and within the communion of saints; from within the big Body of Christ we can learn from each other and honor one another, even as we sometimes disagree with one another. This book is, therefore, as much about ecclesiology, about church and theology as it is about government, legislation, policy or politics. But it is an example of mature conversation, an invitation to join in learning more and broadening our views. Compare and contrast this with another similar book I’ve often recommended, Church, State, and Public Justice: Five Views edited by P.C. Kemeny (IVP Academic; $20.00) which tends to be more about different Christian views of the state, how public justice is defined within different Christian schools of thought, and what sort of ways different traditions answer the question about how the government should (or shouldn’t) work to bring about a just social order. That book, too, offers five noted contributors who each offer a major chapter and then respond to the other four positions. It seems a bit more eager to jump to the political science, but is, like Dr. Black’s, delightfully broad and ecumenical. The five traditions represented in that book edited by Dr. Kemeny are a Roman Catholic perspective (written by a Roman Catholic political theorist, Clark Cochran), a Classical Separation perspective (written by a Southern Baptist attorney and liberal arts Dean from Baylor, Derek Davis), an Anabaptist perspective (written by Ron Sider, a Brethren scholar and political activist), a “Principled Pluralist” perspective (written by a Calvin College political science prof, political pollster, and board member of the Center for Public Justice, Corwin Smidt) and what seems to be a “realist” social justice perspective, written by a mainline Protestant social ethicist and Washington DC-based United Methodist pastor, J. Philip Wogaman.) Church, State, and Public Justice: Five Views edited by Professor Kemeny, is deeper, a bit more heady, not primarily written by theologians but by politicos, and is therefore exceptionally useful for those serious about thinking about political questions, as such. Perhaps it would be a good follow up to the broader, more theological approach taken in Black’s Five Views on The Church and Politics. 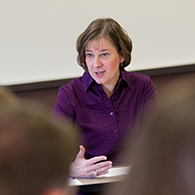 We have focused on these differences to help readers think more deeply about the dynamics of Christian witness in the public sphere and consider alternative perspectives. But the purpose of this book is not to convince readers they must choose a side as if in the midst of a raging debate. Instead, we invite readers to compare and contrast central ideas and themes from each tradition to help them develop a more thoughtful, careful, and Christ-centered approach to politics and government. And that is an urgent need. 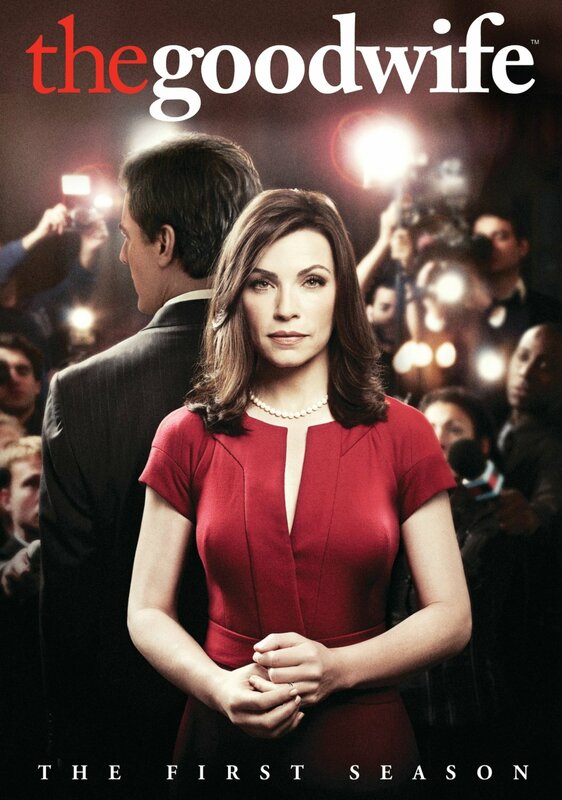 Because if you think the characters and politics and campaigning in The Good Wife is outrageously flamboyant, welcome to US politics in real time circa 2016. We who follow Jesus simply must be discerning and thoughtful about how we can most faithfully respond. But we don’t have to reinvent the wheel, or fret that we are the first to face times such as these. God’s people have been here before and people smarter then most of us have considered these things deeply. These books can help.